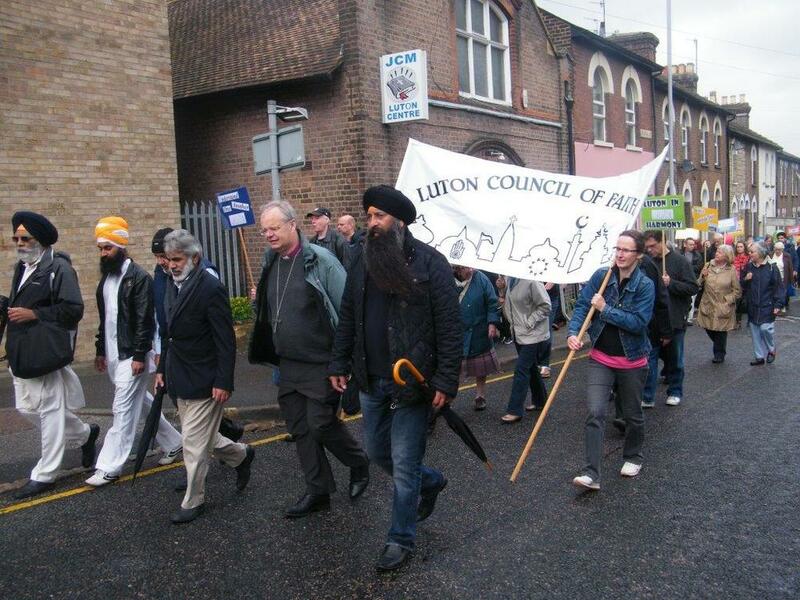 On a rather wet day of the 21st of September, nearly 150 people from diverse faiths, cultures, ethnicities and nationalities, walked together showing public solidarity and friendship by visiting different places of worship, this year: Guru Nanak Gurudwara on Dallow Road, the Holy Ghost Catholic Parish Church & Jamia Islamia Ghousia Mosque, both on Westbourne Road. With opening remarks from Zafar Khan, Chair of Luton Council of Faiths at the Town Hall, Luton’s Mayoress Cllr Sheila Rodden, Bishop Rt Revd Richard Atkinson and MP Kelvin Hopkins also shared greetings. Car loads of food items were collected for Luton Food Bank, generously donated by various community establishments including Foxdell Primary School, St Joseph Catholic Primary School, OM Group, the Luton Central Mosque and the three host places of worship. The day saw also St Joseph Catholic Primary School children presented about their journey towards becoming a Fairtrade school while at the Mosque; the Mehria Primary School children played melodious Nasheeds and Daff who charmed all the audience.Various communities brought also bread from different cultures which were enjoyed at the Mosque with great hospitality of the host.